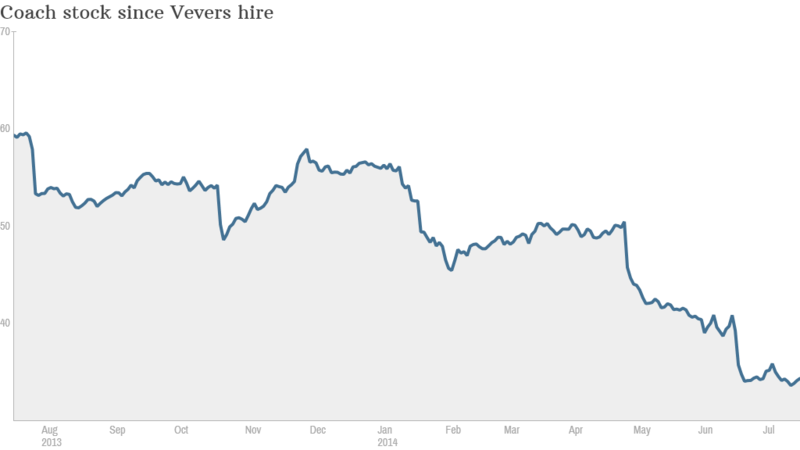 Can Stuart Vevers save the Coach brand -- and its stock? Can this British designer save Coach? 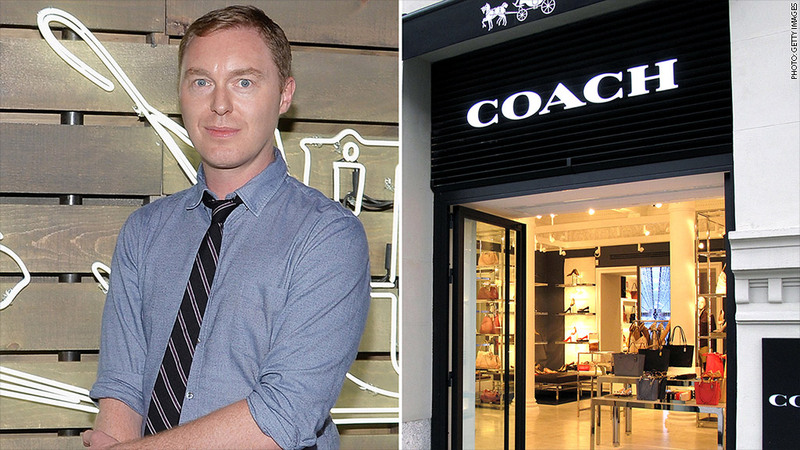 Coach has hired Stuart Vevers to try to revive a brand that has been around since 1941. Stuart Vevers' job qualifies as stressful. The British designer was hired last year to revive the Coach brand, a comeback that may be even harder to pull off than Martha Stewart's. Coach (COH) stock is down almost 40% this year. The bad weather that kept many American shoppers out of stores this winter only exacerbated the company's problems. The brand is stale. Known for its leather handbags, Coach doesn't have a clear identity anymore. The company, founded in 1941, really hit its stride in the 1990s under the dynamic duo of CEO Lew Frankfort and head designer Reed Krakoff. They popularized the concept of "luxury for the masses." They found the sweet spot in the retail market where customers wanted a bit of brand cache but at a cost that was a lot less than Prada (PRDSF) and Gucci had to offer. The company went public in 2000 (as a spin-off of food company Sara Lee no less) and the stock rose steadily for a few years with the introduction of products like the "Hampton bag." Wall Street pushed for growth, and Coach responded by opening a lot of outlet stores, which diluted the luxury brand notion. It also didn't help that competition increased from Michael Kors (KORS), Kate Spade (KATE)and Tory Burch, among others. Coach's turnaround plan: Enter Vevers. The company is aiming for the higher-end consumer again now that Vevers is Executive Creative Director. He has the track record. He was named Accessory Designer of the Year by the British Fashion Council several years ago and has worked at other brands trying to reinvent themselves -- such as Calvin Klein and Mulberry. Thanks to Vevers, Coach held its first New York Fashion Week show earlier this year, garnering largely positive reviews. But Wall Street is not convinced that the runway success will lead to higher sales just yet. "Some of his designs will be in full-price stores in the fall. You're not going to see it in the outlet channel until probably 2015, which is the majority of sales" says Evan Staples, a senior analyst at Nuveen Asset Management. He argues any turnaround will be a long time coming. "Only if you're a very risky value investor would you be stepping in here," he says. It's also not clear if this is even the right direction for Coach. "Can Stuart Vevers put good product on the floor? I don't know," says Paul Lejuez, who covers retail stocks for Wells Fargo Securities. "The more important question is even if the product looks good, does it matter? Will people buy it?" Coach is in the process of closing some stores. After the latest round, it will have about 250 full-price stores and 200 outlet stores in North America, Lejuez says. That makes it difficult to re-cast the brand as a more up-scale "luxury-lifestyle" brand when its discount stores are still everywhere. Buying opportunity? Robert Drbul, an analyst who covers the retail sector for Nomura, is more bullish. He has a "buy" rating on the stock, which currently trades around $34, a big drop from 2012 when it traded around $75. Drbul has a target price of $45. "The company has a track record of brand re-invention and a strong team," Drbul says. "Coach clearly remains committed to their dividend, so from the investor standpoint, they are paid to wait and hold their shares." Coach's dividend yields nearly 4%. Drbul also points out that many luxury and pseudo-luxury brands are fighting for traction in Europe and Asia. Bringing on a British designer with many European ties could also give Coach an edge internationally. But the biggest "buying opportunity" may be for consumers. Many retailers are increasing discounts as they try to clear inventory after a slow winter and spring. Coach is also motivated to make room on its shelves for Vevers' designs. So even if you aren't interested in the stock, Coach's current predicament is a good chance to pick up a nice handbag or pair of shoes at a cheap price.